This is where you'll want to order your flax seed, green super foods & pollen. "Wherever flax seed becomes a regular food item among the people, there will be better health." NOTE: You can contact us to set up an automatic order for any items you would like regularly. Do you want to get the harmful chemicals out of your water? "The deeper you dig and the higher you climb, the more you will learn." I have been in the natural health field since 1975, including formerly owning a health food store, starting a natural organic food co-op, distributing to other stores, writing books and teaching others about natural health and holistic wellness. I consider our Northern Edge® Organic Milled Flaxseed, the Delicious Greens 8000TM super food mix and the PollenAid flower pollen extract to be among the highest quality health food products I have ever encountered. Every morning for breakfast I eat a bowl of either amaranth, buckwheat or quinoa, simmered in water, then adding raw flax for the flax seed benefits, with some turmeric and cinnamon powder. I also daily drink a liquid mixture of the Delicious Greens 8000 and spirulina for the super food antioxidants, enzymes and other phyto-nutrients they provide, plus a few pollen tablets. The benefits of flax seed are becoming well known. Flaxseed oil provides an important essential fatty acid that improves many body functions. The best way to get the oil, is to eat flax seed with a high oil content. Extracted oil is often rancid and therefore not healthy to consume. There are no bad side effects of the whole flax seed. Flax oil is a key source of Omega 3 fatty acids that are important for good brain function and calm nerves. Flax seed is also rich in a special class of antioxidants called lignans that help protect against many health problems, as well as high quality proteins, a variety of minerals and an ideal mix of both soluble and insoluble fiber that is appreciated for improved bowel elimination. Our flaxseed is certified organically-grown in a region of Canada that has been farmed by organic agriculture for over 35 years. The farmers there have perfected their growing, harvesting and storing methods to protect the cleanliness and quality of their flax seeds. Further, this is a rare section of North America that has no toxic metals in the soil, particularly cadmium which is high in almost all of the rest of the continent. The cold climate and rich soil of this area of Canada cause the flax grown there to be much higher in oil (45%), particularly in Alpha Linolenic Acid (ALA, Omega 3 source) than any other flax seed. About 60% of the oil content of Northern Edge flax is ALA. 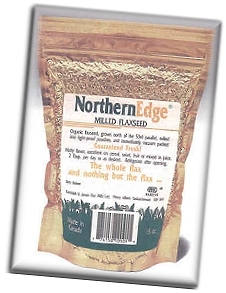 The special milling process used to mill our Northern Edge® organic milled flaxseed leaves the valuable oil intact in the self-sealed pieces of seed. 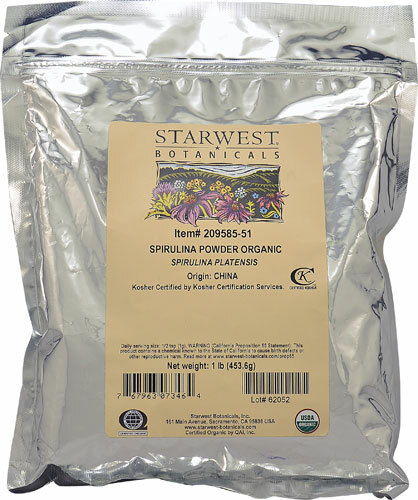 This premium flax seed is milled and packed into vacuum-sealed bags to protect it. It is far better than ground flax seed. The oil, the antioxidant lignans and other beneficial nutrients are thoroughly protected from oxidation with our method, but they are available for easy digestion and use by the body for better health. Two tablespoons per day of Northern Edge® organic milled flaxseed, sprinkled on or mixed with other foods, or just taken straight and washed down with water or juice, will provide an abundance of good nutrients and the many flax seed benefits for the body. I also urge you to try the Delicious Greens 8000TM that we offer for your even better health. It has an incredible 8000 ORAC units (measure of antioxidant capability) per serving. The PollenAid flower pollen extract is a unique Ohio product with multiple benefits, including non-hyper energy and stamina. It is from rye grass, cleanly grown in protected fields and collected directly from the plants without robbing any bees! We endeavor to be your best source of flax information and the highest quality flax seed product, as well as the best green food mix and flower pollen extract. This is where you'll want to order your organic milled flax seed, super greens and pollen. After almost 45 years in the natural health business, we at Natural Health Enterprises continue our dedication to giving our customers the best products, pricing and service. NOTE: This is a small independent business needing your support to continue offering important information and outstanding essential products. Please consider making a purchase and refer your friends. Thank you. NOTE: We can prepare a coded gift certificate in any increment of $10, which the recipient can redeem with us for purchasing items we offer. The base price is set at $10. The value may be increased to $20, $30, etc. by changing the quantity to 2, 3, etc. Click here to order a gift certificate, which will be prepared and emailed to you for optional printing or forwarding. The recipient would then contact us for applying the certificate using the unique code. Contact us about multiple certificates in any amount. Delicious Greens 8000TM is a comprehensive powdered mixture of high antioxidant organic greens (eg., dehydrated grass juices & edible algae), protective herbs, enzymes, pigments, fiber and probiotics; plus many other outstanding super foods. It has an extraordinarily high ORAC (antioxidant) value of 8000. Good news! -- It is very affordable. Get your daily super foods, and feel better and better. Copyright 2003-2019 by Natural Health Enterprises -- All rights reserved.